April Adventure is a lot of fun and parents will enjoy reading the story with their children, helping them solve the mystery of the missing golden eggs." > April Adventure by Ron Roy, a Mysterious Review. 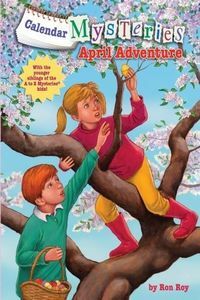 Review: Twins Bradley and Brian and their best friends Lucy and Nate are on the trail of some golden eggs that have vanished in April Adventure, the fourth early reader chapter book in the series of Calendar Mysteries by Ron Roy. Bradley wakes up on the Saturday before Easter to discover a plastic egg near his head. Inside is a small piece of paper with a cryptic message, signed by The Shadow. Lucy and Nate are on a sleepover and they, together with Brian, all find similar eggs on their pillows. They combine all their messages, which tell them to go where a rose grows to find 12 more plastic eggs and 4 real golden eggs. If they do, they'll receive a treasure. The four friends head to a nearby park where they quickly find the 12 plastic eggs, but the 4 golden eggs remain elusive. Could they have been stolen? Or worse, eaten by one of the park's many native animals? And just who is the mysterious character, The Shadow, and what is the promised treasure? April Adventure is a delightful book for kids. The story starts out as a scavenger hunt before quickly turning into a mystery. Most of the story takes place in Green Lawn's Center Park; a map of the park preceding the first chapter is helpful in visualizing the locations visited. Just as an in adult mystery, the young sleuths eliminate some of the more obvious suspects before devising a scheme to identify the real culprit. It's a lot of fun and parents will enjoy reading the story with their children, helping them solve the mystery of the missing golden eggs. Acknowledgment: Random House provided a copy of April Adventure for this review.